Turkey with Sherry, Prosciutto, Thyme for Cooking gourmet main course. Any cut of turkey breast will work for this. Or you could use chicken breast. Amontillado is a semi-dry sherry, between 'fino' and 'cream'. Use any sherry you have on hand. Slice ham into bite-size pieces. Heat oil in nonstick skillet. 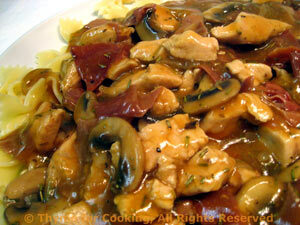 Add mushrooms, ham and sauté 5 minutes. Add stock, sherry, rosemary, sugar, cover and simmer 10 minutes. Uncover, stir in cornstarch mixture to thicken.